At TPC Racing we strive to design and produce products for those who demand the best in performance from their Porsche vehicles. 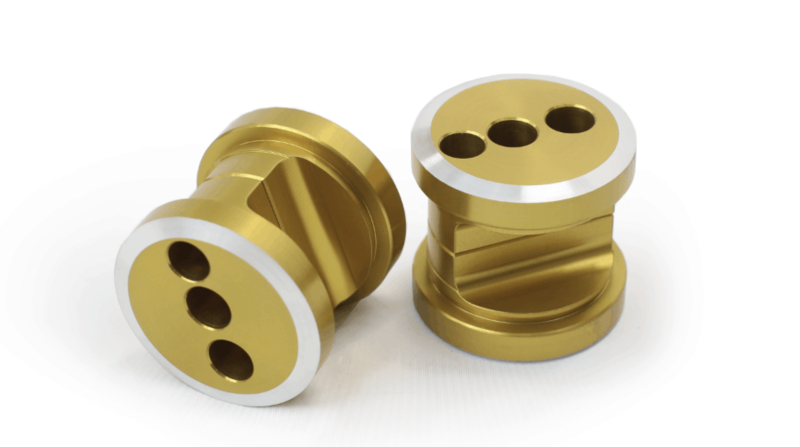 Using our vast knowledge and experience on and off the track, we have designed the TPC Racing Adjustable Thrust Arm Bushing Kit, for the driver looking to get the most out of their car. 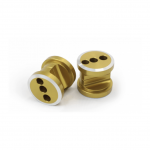 TPC Racing Adjustable Thrust Arm Bushing Kits are the perfect answer for both a street driven car, the occasional track day car, or for any full race effort. 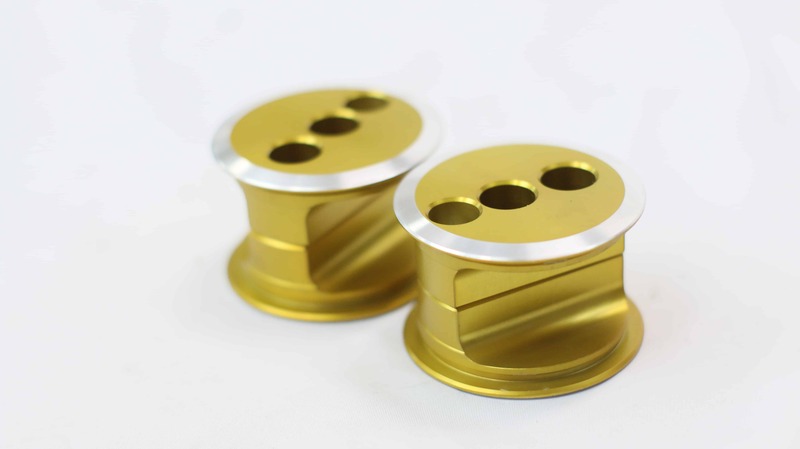 The TPC Racing Adjustable Aluminum Thrust Arm Bushings are designed to replace the factory rubber bushings, which cause unwanted caster changes under acceleration and deceleration. Elimination of these rubber bushings results in more precise and consistent handling on both the road and track. TPC Racing Adjustable Thrust Arm Bushings also allow for a wide range of caster adjustment. Because the vehicle’s suspension geometry and rate change as you accelerate and decelerate, it is essential to have enough adjustability and rigidity on the suspension to combat any negative handling characteristics the vehicle may exhibit. TPC Racing Adjustable Thrust Arm Bushing Kits are the best solution whether you are trying to achieve the perfect race setup or just increase everyday drivability. TPC Racing Adjustable Thrust Arm Bushing Kits are made from 100% aircraft grade material. Also TPC Racing is one of the only sources to offer you with 2 different sizes of Adjustable Thrust Arm Bushings. *Sold in sets of 2. One set required per axle. Now introducing fully dynamic suspension for the 9×1 platform! The DSC Sport V3 controller features all the same great technology and tuning capabilities as the V1 9×7. Additionally, the V3 controller introduces velocity compatibility and magnetic motor mount tuning control. All 981/991 models are Velocity compatible, made possible by the factory four wheel ride height sensors now equipped on all models. Velocity tuning allows adjustment based on the velocity of the piston rod movement, more accurately tuning the chassis to road surface changes. This feature provides a new dimension of tuning that maximizes both performance and comfort. The V3 controller also improves upon the dynamic engine mount control offered as an option from the factory. This is a vital improvement for precision handling in fast corners, high speed transitions, and rapid load changes. At TPC Racing, product development never ends. We are always looking for new ways to improve our already fantastic system. In our quest for more power from our 997Turbo RSx program, we began experimenting with different headers, and found a setup that greatly improved exhaust flow, yielding significant improvements to both the low and mid-range performance. With the addition of the RSx Headers, the TPC Racing 775RSx packs an even bigger punch than before! Performance in the mid-range has been boosted by an amazing 80whp and nearly 100lb/ft of torque! The TPC Racing RSx Headers definitely take the 775RSx system to the next level! This increase in performance has boosted the 775RSx's numbers to a whopping 775HP*** and a mind-bending 770lb/ft*** of TORQUE!! * prices subject to change ** Output will vary between vehicles *** All WHP(wheel horsepower) figures are determined using a Dynojet Reseach Inc., 224x RWD dynomometer. All BHP (crank/brake horsepower) figures are estimated. Huge Power Demands Huge Airflow! The key to huge horsepower in high performance cars is air density; or how many oxygen molecules are present in a given amount of air. A higher air density(more oxygen) allows for more fuel to be burned and thus, more power to be produced. In the world of high performance tuning, it is a never ending quest to find new ways of achieving higher air density. With that goal in mind, TPC Racing set out to create the ultimate intercooler design for the Porsche 997/996Turbo. What we came up with were the massive TPC Racing 127mm(5") RSx Intercoolers; and we are very confident in saying that you will not find a better intercooler assembly anywhere...period.